Let no one ever say that I ever do things by half. Just one week into the oven being delivered and fitted and I’ve already made three cakes. Oh yes, my baking addiction is back on track which just goes to show that cold turkey really does not work. At least where the chemical reaction between sugar, flour and eggs is concerned, anyway. Taking a cake out of the oven and covering it in icing fills me with delight, whilst eating said cake and sharing with friends and family just makes me feel very happy to be alive. It sounds cheesy, but food really does bring people together and it’s rare to attend an event without food being at the centre of things. The best things about cakes beside the fact they taste scrumptious is that they are completely unnecessary; full of ingredients that are of no nutritional benefit and expensive to make, to me cakes embody just how much humans eat for pleasure instead of just simply surviving, at least if money allows. Life is short, lets eat well and enjoy what we put in our cake holes (a literal description of my mouth this weekend). 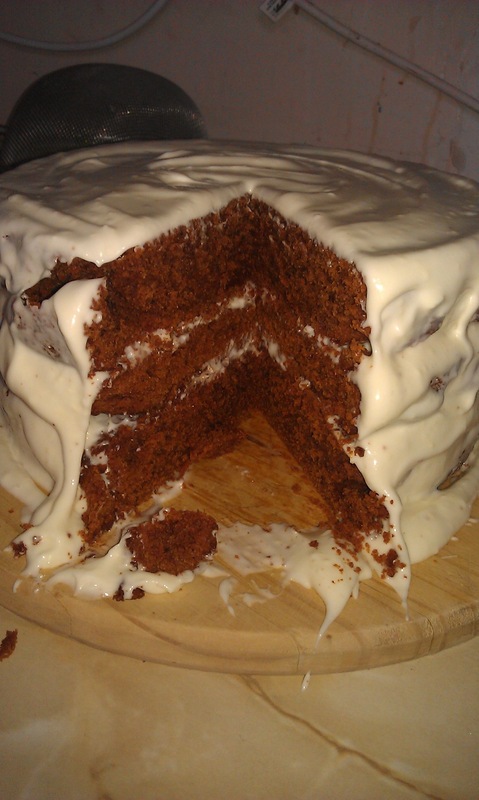 My first cake of the week was a red velvet, the much loved American cake topped with a cream cheese frosting. I got the recipe from my favourite food blog Smitten Kitchen which is basically the food blog all others aspire to be. You really should check it out although if you deign to come back here after seeing the perfection of SK I can only apologise for my sloppy work. I’m just not cut out to test, re-test and then re-re-test recipes for your cooking pleasure, but I’m very glad that SK does, her recipes are fantastic and her cookbook is on my wish list. This cake is made up of three layers so it is a big cake and all the more fantastic for that. The cake uses a lot of cocoa powder which means that you need to use a larger quantity of red food dye to overpower, if you will, the colour of the cocoa. I was 5 tablespoons short of what was needed dye wise so my cake was more brown velvet which was not as striking and attractive as the traditional version but so be it. Taste wise though it was great, with the cocoa coming through very strong which is not always the case with red velvet. The cream cheese frosting would not set despite my best efforts and while icing the cake crumbs would mingle with the icing, resulting in a lumpy and rather unattractive cake. No matter, it still looked pretty impressive and triumphant, standing there high and mighty in the true spirit of Americana. Not wanting to stop with the one cake, this weekend I cracked open the Nigella books. 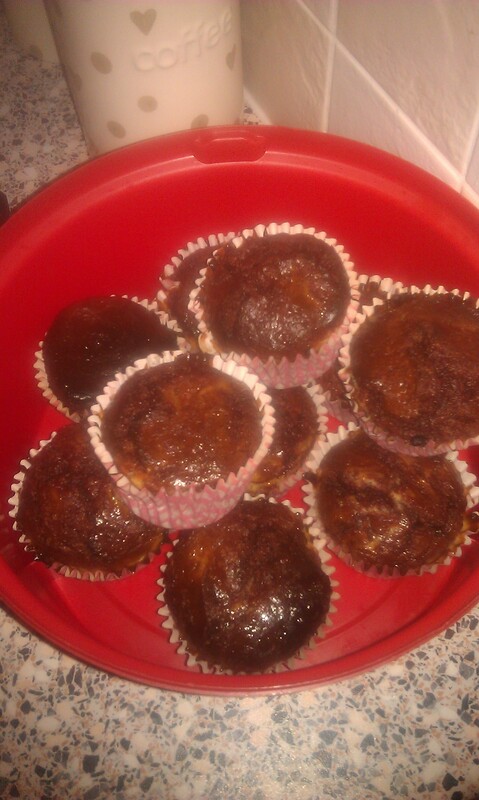 In my eyes it’s not home until a Nigella treat has been baked so to make up for lost time I baked two. Common sense, no? Feast gave me just what I was looking for, a chocolate Malteser cake from her Chocolate Cake Hall Of Fame chapter. I feel it should be obligatory for every cookbook to have a similar chapter as there is no finer thing to pull out of the oven than a chocolate cake. Although don’t quote me on that next time I’m extolling the virtues of a roast dinner. 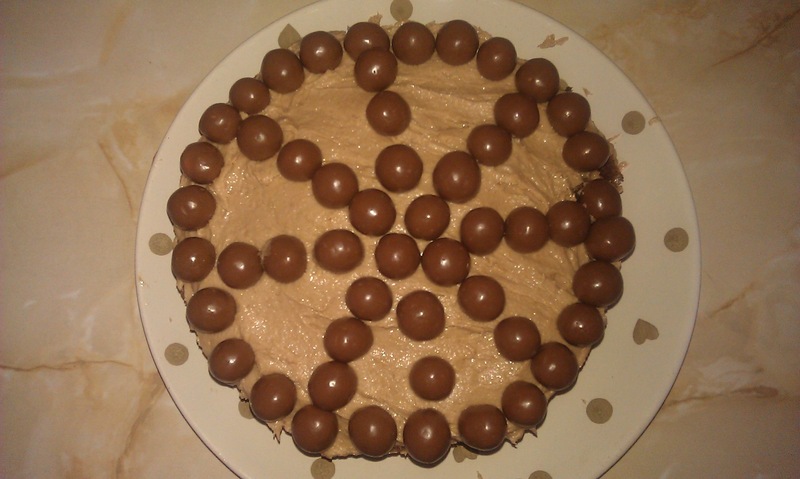 This cake is pretty decadent, what with being sandwiched and covered in a cocoa and Horlick’s buttercream icing and then studded with Maltesers. The cake itself is quite fudgey with a malty, chocolatey flavour but the real star is the icing. As you can well imagine I was full of despair when there was small amount of icing leftover in the bowl for me to eat, the taste is what I would describe as something along the lines of malty fudge with a chocolate undertone. This cake is a winner and I highly recommend you make it, however you’ll get no complaints from me if you were to only make the icing. Heavenly. 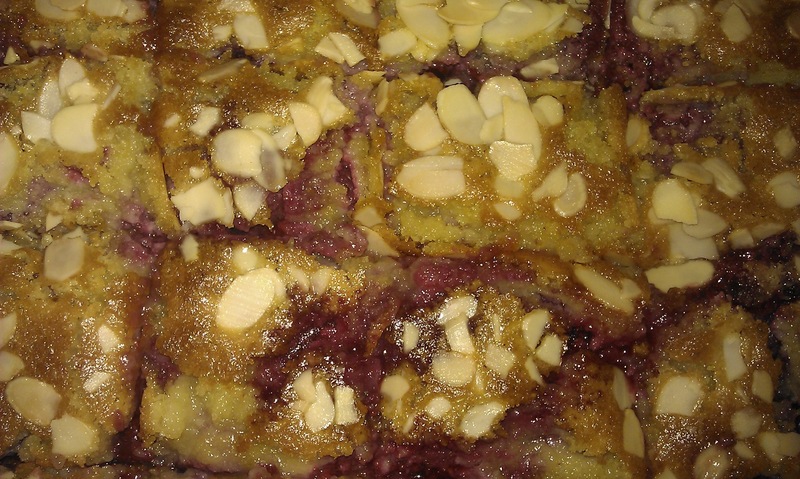 Last by by no means least, I made raspberry bakewell slices from Kitchen, a pretty mammoth Nigella cookbook but one which has served up many delights in our home. Not strictly speaking a cake, instead a pastry base filled with jam, raspberries and frangipane (one of my favourite words ever, it just sounds so made up), but does it really matter? This recipe epitomises why I love Nigella so much. Other cookbooks would tell you to make a pastry, roll it out to a specific thickness and then drape over your baking tin, which is what can put people off pastry making because it is such a ball ache. Nigella saves the day by making it as simple as possible, just combine all your pastry ingredients and then press into the tin with your knuckles. Perfection itself and completely stress free. I think I took these out of the oven too early as on cutting into squares the middle fell apart and they aren’t quite as solid as they probably should be but they are by no means inedible. They are too edible in fact. Crisp, buttery, sweet pastry with a fruity, jammy middle topped with almond frangipane and flaked almonds, they are seriously tasty. Sour from the fruit but with enough sweetness to balance the whole thing out. I wish they’d kept their shape a bit more but all is forgiven when tasted. If you’re worrying about my arteries, cholesterol and waistline after this excessive and somewhat obsessive baking binge, fret no more as I had a steady stream of visitors today who I weighed down with cake whether they wanted it or not. I just can’t wait now for The Boyfriend to get back from his travels in Kiev so I can cook his favourite meals that until now have been out of reach. It’s safe to say that the slow cooker and George Foreman grill have been tucked well out of the way to gather years of dust. Good riddance.